In mobile communication carrier base stations (typically carriers for smartphones) installation space for communication power supply units is limited. For this reason, most power supply units are becoming smaller and lighter with lower power consumption. Of course, the rectifier unit contained in the power supply unit at the base station needs to be small (densely mounted), light, and highly efficient. Under these circumstances, we have developed a high-efficiency rectifier unit that has improved on a lot of issues compared to the conventional model. The big feature of this product is the significantly downsized body of the unit, as illustrated in the following table. The product is about half the size of conventional models by volume. This achievement saves resources through reduced material use. We have made numerous efforts to reduce power consumption and have achieved high efficiency. In particular, we have focused on efficiency improvements at the 60% load application, which is believed to be the normal level. 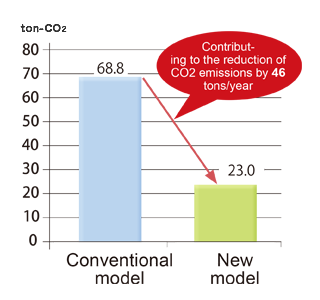 The efficiency has increased by as much as 5.4% compared to conventional models. 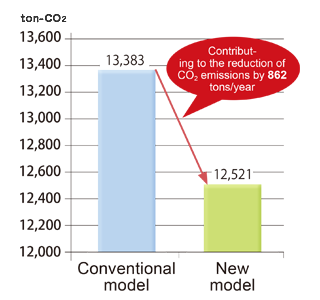 This contributes to the reduction of CO2 emissions and running costs, even when a light load is applied. Reduces the loss of diodes used in power factor correction circuits, called PFC circuits. Changes the secondary-side rectifier circuit system. Changes the conversion frequency band. 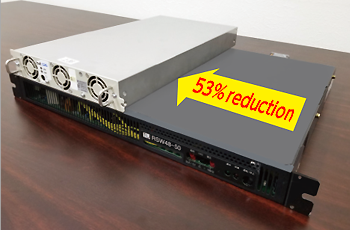 Optimizes the transformer use efficiency. Changes the conventional circuit system in which three phases are controlled collectively into a system in which three phases (R, S, T) are divided into each block and are optimally controlled individually. We plan to ship 1,500 units per year. In the future, we will continue development to further improve efficiency. In the automobile market, demand is increasing for hybrid electric vehicles (HEV) and electric vehicles (EV). In the air conditioning systems of gasoline-powered vehicles, a hydraulic compressor was used to adjust air conditioner temperature. However, HEVs and EVs employ an electric compressor that runs on a high-voltage lithium battery. A three-phase motor driver is also required to drive the compressor. This is a new market for future vehicles. 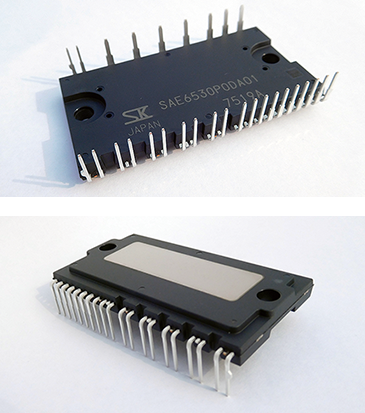 Conventional discrete-parts assembly is being replaced by IC. 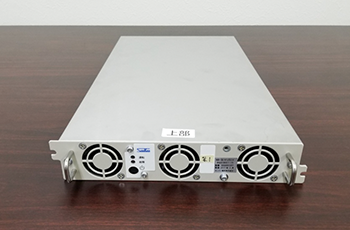 Now, as an optimal product for this system, we have developed the three-phase motor driver SAE6500 series, in which the FS-IGBT, which supplies current to the motor, and the IC, which drives the gate, are combined into one package. We have a lengthy track record of similar products used for household appliances. This product was developed as a new package to achieve low thermal resistance and secure insulating distance, especially for vehicles. In addition, we have reduced noise, which is necessary for vehicles, by improving the diode used for motor current regeneration (soft recovery). Further, by packaging discrete parts together, we have achieved a smaller and more space-saving product (30% total reduction). This small product enables heat dissipation using the electric compressor housing. 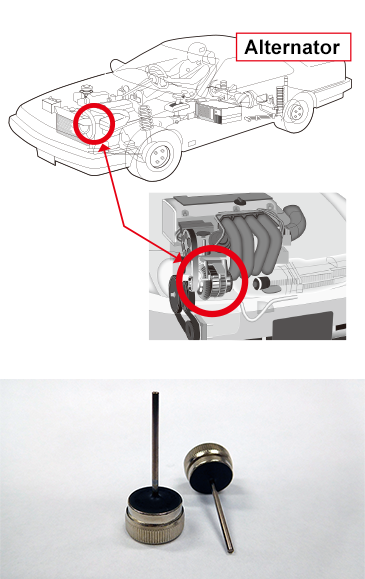 Packing parts together has shortened the internal wiring, resulting in reduction of noise, which is a major obstacle for vehicles. Currently, the 650V30A unit and 650V50A unit are available in the SAE6500 series. In the future, we plan to develop a low-cost version of the 650V50A unit. 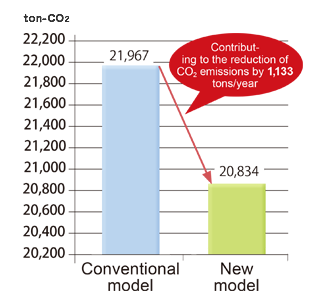 In consideration for the environment, regulations on vehicle CO2 emissions are being strengthened every year. As part of CO2 emission improvement, development of high-efficient alternators is becoming a challenge to each automobile manufacturer. The following is a brief explanation of alternators. For safe and comfortable driving, most devices used in vehicles (such as lights, power steering, power windows, etc.) require electricity. The alternator plays a role in generating electricity during driving and supplying electricity to each device and to the battery. The alternator has the following functions: (1) The rotor rotates to make the stator coil generate alternating current. (2) The rectifier equipped with a diode performs rectification. (3) Direct current is supplied to the battery and to each device. Usually, the six diodes made by us used inside the alternator are inadequate. The diodes are used inside the hot engine room, and the temperature is shown to exceed 200°C because of heat generated by rectification. Further, there is no cover and the diode location is exposed to the outside. The diodes are therefore mechanically installed to the main unit of the alternator by press-fit, rather than soldering. Now, we have developed reduced forward voltage drop (VF) for alternator diodes, which is in particularly strong demand among customers. How did we minimize forward voltage drop (VF)? To solve this challenge, we employed a JBS structure inside the chip (element) through our unique technology. JBS is an abbreviation of Junction Barrier Schottky. It is one of the advanced Schottky junction diodes. Technologically, surge current resistance has been increased by providing PN junction components. Further, by decreasing the space between them, the structure enables IR suppression (leak current suppression). The high reliability is on par with conventional models. We have achieved the following results. With a single one of our diodes, VF has been reduced by 30% compared to conventional models, and the output efficiency of alternators equipped with the diodes has been improved by about 2% to 3% compared to conventional models. In the future, we plan to develop a next-generation lower VF version by further improving efficiency. It is said that air conditioners account for about 25% of total household power consumption. Reducing the power consumption of air conditioners has a significant impact on home energy reduction. In addition to air conditioners, high efficiency is becoming an important challenge for power electronics products, including home appliances, in terms of environment and energy. Further, for power semiconductor switching devices used in the industrial equipment field (such as inverters and uninterruptible power systems (UPS)) and the in-vehicle field (such as hybrid electric vehicles (HEV) and electric vehicles (EV)), high resistance is required in addition to low loss. With increasing demands for energy-saving and safety in a variety of equipment, we have developed the 650V FS-IGBT, which achieves low loss and high resistance. For example, as a part of the electronic circuit of an air conditioner, this device is used in a control circuit called a "power factor correction circuit," which is indispensable for adjusting the power waveform called a "harmonic," in addition to reducing power consumption. If the device is used in the power component circuit of a variety of equipment, it will inevitably increase the IGBT switching speed to respond to the high frequency. When that occurs, there is a problem that the on-voltage of VCE (sat) will increase. 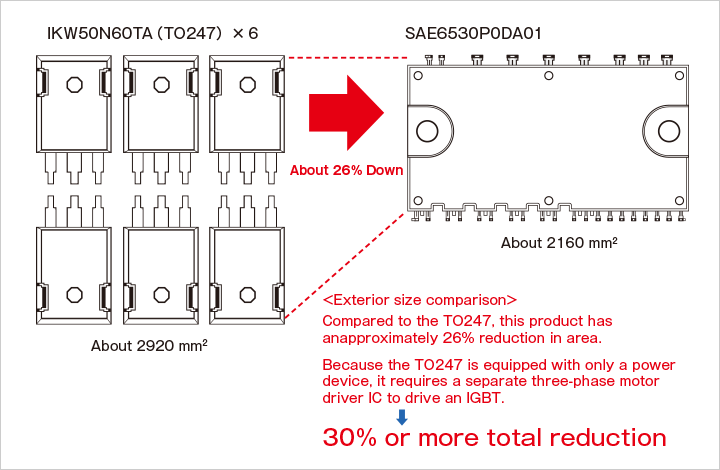 For both low switching loss and low VCE (sat) with high-frequency IGBTs, we have achieved improvements by employing IGBT with a FS (Field Stop) structure. With this FS structure, both high frequency and high resistance have been achieved. This has enabled application of IGBT even in fields that were difficult for existing PT (Punch Through) structure IGBTs. In the future, we plan to implement process development with a goal of lower-loss VCE (sat) type. We plan to ship about 22 million units per year. It is believed that installing this product in a variety of equipment will significantly reduce CO2 emissions. To differentiate their LED lights, each company has emphasized luminance efficiency so far. However, luminance efficiency is approaching its theoretical limit and it is becoming more difficult to differentiate on that basis. Of course, there are, as always, still needs for energy-saving. However, LEDs must increasingly meet a variety of installation conditions. We have uniquely developed LED control technology that utilizes phase control. Thanks to a significant decrease in the size of the LED control equipment, we have succeeded in commercializing an AC-direct LED module in which the control circuits are integrated into the LED board. 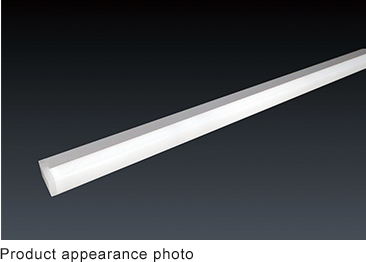 Despite its small size, it maintains or strengthens the performance required for lighting, and achieves both space-saving and high performance. For example, in household equipment, it has become common practice to use a part of the storage or to hide the control equipment in the back in order to secure installation space for the control equipment necessary for lights. Occupation of storage space and complicated wiring have become challenges that need to be addressed. In addition to reducing power consumption, our AC-direct LED module enables a reduction in power supply equipment or adaptors by decreasing the size and the number of components. This enables easier switching to LED lighting in household equipment. It is possible to achieve a more energy-saving product compared to conventional fluorescent lights in addition to designability unique to LEDs. For example, an LED light used in certain household equipment saved energy by 66% compared to conventional fluorescent lighting. One of the central features of LEDs are their long service life, which helps reduce troublesome replacements and cut down on waste materials. In the future we plan to apply the product to in-wall lighting so that we can contribute to the global environment through further energy-saving and reduction of CO2 emissions. Calculated based on the annual lighting time of lighting equipment described in "Explanation of the energy consumption calculation method based on the standards of judgement for residential construction clients" specified in the Energy Conservation Law. High efficiency, low noise, and long life are quickly becoming must-have requirements for consumer applications, resulting in increased worldwide demand for BLDC motors. BLDC motors are becoming the first choice for data centers, computers, appliances, and battery-operated equipment. A BLDC motor when paired with an intelligent drive algorithm, like the one included in the A5932, can provide a high performance, high efficiency solution with a long lifetime of operation. Allegro's A5932 fan driver IC eliminates the need for a microprocessor and software development with a simple-to-use GUI, significantly reducing development cycle time. The three-phase commutation engine is integrated in the A5932. The algorithm optimizes the drive current to operate at the highest possible efficiency, reducing overall power consumption. Power consumption is critical in data centers because the energy applied to cooling can be almost half of the total power consumed. Realizing a small increase in efficiency results in fewer kWh consumed, reducing the carbon footprint and lowering operational costs. 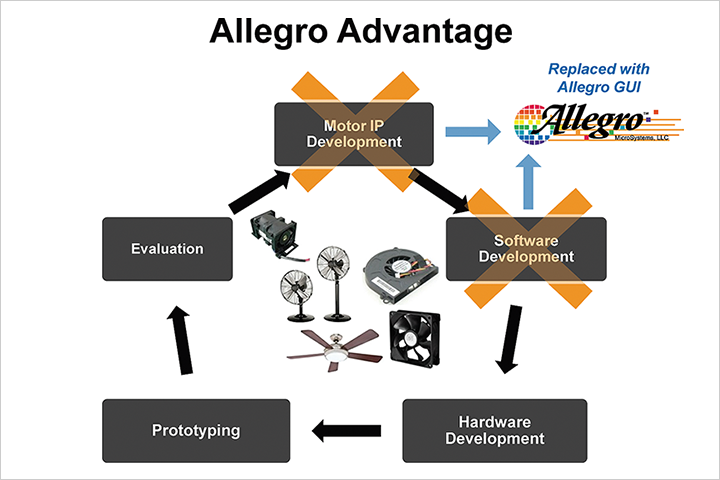 With Allegro's integrated closed-loop speed control, fans can be optimized for single or in-line boost configurations. Speed control can be used to prevent resonance and improve cooling efficacy based on temperature or some other system input, further reducing power consumption. In addition, using closed-loop speed control removes variation in speed caused by motor manufacturing tolerances, eliminating the need for external trim or calibration. A high level of integration means a solution with the A5932 has few external components that can drive an external MOSFET bridge and deliver up to 400 W to the load. The sensorless commutation algorithm eliminates Hall sensors, leads, and supply bias, further improving system power consumption while lowering cost. In addition, a sensorless solution simplifies manufacturability of the motor by removing Hall variation which can impact motor performance. In traditional microprocessor-based solutions, the software must be developed and tested for different motor and load configurations, such as a different blade. Allegro's fully integrated commutation algorithm can drive a wide variety of motor loads by modifying the on-chip EEPROM. This means there is no software to write, compile, or debug. All parameters can be modified with a simple graphical interface which is easy to learn, improving time to market, and eliminating the burden on software development teams. BLDC motors have far superior operating life than their brush-based predecessors. By using a BLDC motor, maintenance costs are reduced since there is no brush wear. However, brush wear isn't the only concern. Allegro's sinusoidal drive algorithm produces low torque ripple which reduces vibration, resulting in less wear on the motor bearings. Low vibration and torque ripple also has the advantage of reducing the audible noise-important for appliance and computer fan markets. 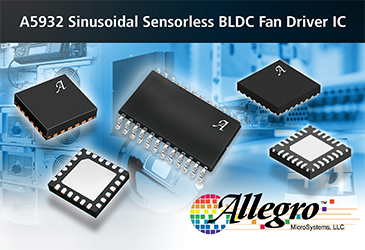 Allegro's highly integrated three-phase sensorless gate driver IC combines an advanced sinusoidal motor drive algorithm with EEPROM memory to provide a high performance system. The A5932 is easy to configure making it an optimal solution in today's market.